You can’t see it. You can’t smell it. You can’t taste it. It doesn’t burn, explode, alter consciousness or make you talk funny. It is anything but rare— in fact, it makes up the greater part of the atmosphere. It is, of course, nitrogen, and it is the apotheosis of dull. Once a year, Reedies fling aside all pretence of neutrality and plunge into communal worship of the seventh element. The nitro-veneration takes form in everything from the freezing of ice cream and everyday objects with liquid nitrogen (ever seen a sock snap in half?) to the recitation of elaborate pro-nitrogen odes. Nitrogen Day, which usually falls on the Thursday eight days before Renn Fayre, has become one of the most popular traditions on campus, enduring for more than 15 years. Yet illuminating its origins is no easy task. Longtime chemistry professor Alan Shusterman has no idea how it started. Biology professor David Dalton, who has affixed his career to unraveling the mysteries of certain plants’ ability to self-fertilize, and who argues that the ability to fix nitrogen industrially was the most important discovery of the 20th century, is similarly baffled. 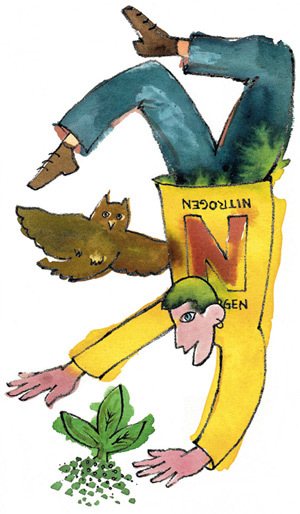 The key to unlocking the elusive origins of N-Day came from emeritus professor of chemistry Tom Dunne, who remembers with pride the impassioned nitrogen-related speeches delivered by science majors in the quad. Dunne says he may have delivered a speech or two himself. “It was always a lighthearted thing,” he recalls. Dunne suggested we contact physics major Rob Mack ’93, who confessed to being one of the instigators, although he stressed that it was a group effort. Biology major Nick Kaplinsky ’93, who helped with the first N-Day, calls it another one of those Reed events that popped out of a “wouldn’t it be great if” conversation among friends. The event was so successful it was repeated the next year. “The most amazing part was how quickly it caught on,” says bio major Al Kun ’95, another principal organizer. By 1994, political science major Francisco Toro ’97 wrote N-Day’s annual Quest advertisement, saying that seeing the inaugural event as a prospie was “one of the main reasons” he chose Reed. From the student handbook to admission office literature, the event—invariably described as the “Seventh Annual” in a nod to its place in the periodic table—has become a quintessential demonstration of Reed culture. Last year, the first known extramural N-Day celebration was held at the house of chem major Steve Carlson ’93 in California. Why nitrogen? Theories abound. “It was fun to say, ‘I will make you love something you didn’t know anything about,’” Mack recalls. Nitrogen’s tendency to be overshadowed by flashy elements such as oxygen also appealed to Reedies. “People feel they must root for the underdog,” recalls physics major Ben Brau ’93. If one were to remain neutral on the subject, one could argue that other elements are as interesting and as important. Oxygen supports combustion; carbon is essential to all known forms of life; helium makes you sound like Donald Duck. Among Reedies gathered in the Quad for N-Day, however, any suggestion that another element might make a superior object of veneration will elicit a chorus of boos. Whatever the reason, Reed and nitrogen share a unique and powerful bond. For more apocrypha about Reed football cheers and the Columbus Day Storm, visit the Reed Stories website at reedstories.reed.edu.